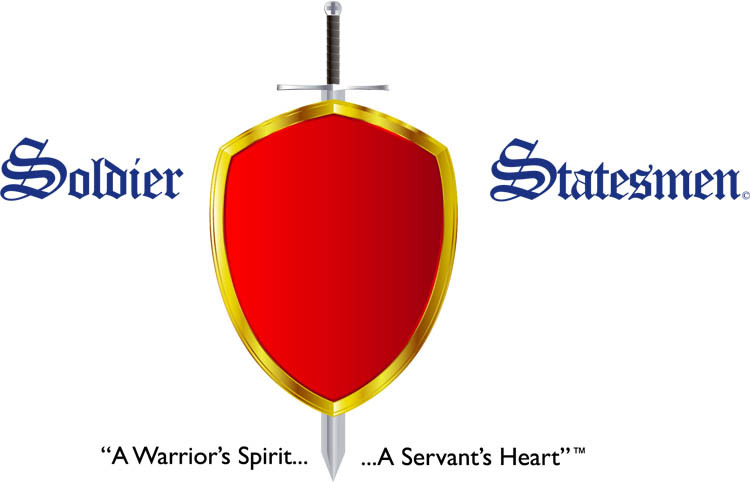 The Soldier-Statesmen is more than an organization. It is an ideal. Since the dawn of human history, there have always been champions of human dignity, freedom, enlightened leadership and the rule of law. From the ancient states of Sparta and Athens, to the Middle Ages and Renaissance, to America's "Greatest Generation," a distinctive assemblage of citizens have served their fellow man by committing to the purposeful mission of providing a lifetime of devoted service through examples of unwavering duty, courage, chivalry, sacrifice and selflessness. Soldier-Statesmen aspire to uphold these same virtues and leadership in today's world. No one prays for peace more than the soldier and no one understands the value of democratic ideals, esprit de corps and ethical stewardship more than the military veteran. Such citizens had a monumental impact on this nation’s founding and have been integral in preserving the American ideal throughout periods of marked global change. Soldier-Statesmen exist in every sector of society, leading by example while others lead by self-promotion and excess. Having once answered the call to duty to protect and defend this great nation, they now help preserve our moral fiber and national identity, while having a tremendous effect on our corporate, governmental, social and political landscape. While scandal and disgrace embroil and ensnare those driven by expediency, comfort, self-gratification and singular focus on increasing their own station at the consequence of others, Soldier-Statesmen are purveyors of discipline, wisdom, selfless service and sense of community. © Copyright 2005-2011. The Soldier-Statesmen. All Rights Reserved.